Ever since the fall of the Soviet Union in the early 1990s, Hollywood, television, and true crime publications have depicted the Russian mob (known as the mafiya) as almost superhuman—a vast, international network of tatooed thugs with their blackened hands dipped in all manner of illicit activites. There is plenty of truth to this stereotype, but author Mark Galeotti makes the case that organized criminal activity in Russia has been a sociological problem since the days of the tsars. More specifically, The Vory argues that when the Russian Empire first began industrializing along the same lines as the Western European nations of Great Britain and Germany, millions of impoverished peasants flooded cities like Moscow and St. Petersburg. A majority of these migrants were forced to live in squalid slums, where crime became the only meaningful means of everyday sustenance. Known collectively as vory (thieves), these criminals still plague the Russian state today. The Vory tracks the many changes and developments in Russian criminal history. During the days of the tzars, horse thieves were common in the hinterlands because of the limited resources of the monarchy. Even at the height of the monarchy’s competence, Russia still only had one police officer for every five hundred citizens. Most of these police officers would rather react to crime rather than prevent it, and like so much of Russian society at the time, these “boys in blue” were often woefully corrupt. As a result, peasant horse thieves were often contracted by the locals to act as village guards. Talk about putting wolves in charge of the hen house! With the coming of the Bolsheviks in 1917, the vory flocked to the Reds, and before long, many of the formerly idealistic Communists recognized that the Cheka, the brutal secret police of Lenin’s Soviet state, were rotten with former brigands, hooligans, and bank robbers. Even Stalin, himself a former fixer for Black Sea pirates, could not tamp down on the vory, for during the 1950s, street crime in the Soviet Union reached epidemic portions after the closing of several gulags. These days, Galeotti writes, Russian organized crime has gone “legit.” In other words, the centralized authority of President Vladimir Putin has coopted many Russian gangsters and turned them into extralegal representatives of Moscow. The line between legitimate and illegal has never been so blurred in Russian history. 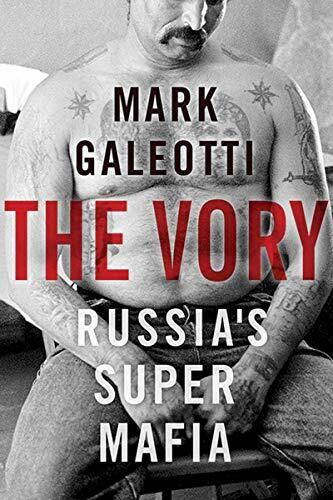 The Vory is a fascinating tale about Russia, its colorful criminals, and the sociological implications of organized crime. The vory once spurned traditional Russian life by marking their bodies with blasphemous and ironic tattoos. These days, gangsters more often wear suits and ties and are members of the Russian upper class. Galeotti notes that Russian organized crime is known for its hierarchical structure, which is something that adopted from the old tzarist government. It is therefore not uncommon to find fraudsters with Ph.Ds. The Vory is also an excellent rewriting of some of the myths that more left-wing historians reiterate about Russian history. Galeotti argues that by the time of the Russian Civil War (1917–1922), the Bolsheviks had fully militarized, had accepted repression as a legitimate form of Communist “conversion,” and had accepted into their ranks thousands of ex-criminals who still carried out their nefarious deeds while wearing government uniforms. Similarly, The Vory dismantles the nationalist hero Dzhokhar Dudayev, the secular leader who won Chechen independence from Russia in 1996. Despite glowing tributes to the man, Galeotti writes that Dudayev was a gangster warlord who turned Chechnya into a thieves’ paradise. Under his rule, former Russian soldiers and ethnic Russian settlers were bought and sold on Grozny’s infamous slave market. For those who want a better understanding of Russia and its history, The Vory is a fun place to start. This engrossing history book offers up at least one very dire warning: When a large segment of the population becomes brutalized (see for instance the Soviet war in Afghanistan) or when cynicism rules on the streets, organized crime will bloom in manifold ways.